An interesting list of learning/creativity card decks, from a collapsnik colleague Venessa Miemis: http://emergentbydesign.com/2012/10/25/21-card-decks-creative-problem-solving-effective-communication-strategic-foresight/ We're #15. These cards have many potential applications. I have heard a number of positive reports about their use by individuals and groups--including a cohousing group which used them to get past major difficulties to hold a very productive, constructive meeting. I am sitting here in complete awe of the pattern language deck. It is simply amazing, inspiring, and affirming. This is an incredible offering to all of us who seek to serve groups and for all groups who seek to become what they are meant to be. So much wisdom distilled. Thank you!! This is a monumental work. Do not confuse this with the cheesy, glib, marketing card decks that have become common lately. This deck is a work of art and a deep distillation of a wide variety of deep wisdom, many years (decades, actually) in the making. These beautiful cards mark a watershed in the evolving power of conversations, quality personal interactions, and vibrant gatherings and communities. Before these cards were released, we had methods, values, and principles. Now we can dig deeper into the underlying dynamics that make different forms of conversation work their different forms of magic. Need a productive response to a challenging situation? Group Works can help. The beautiful cards make visible underlying dynamics of great interactions. 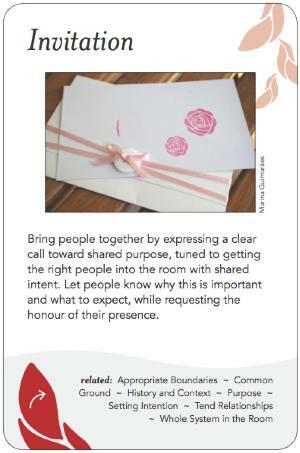 Use the cards to prepare for engaging creatively. Then dive deeper into the magic of group process through the wiki and booklet. You can even be part of a system for evolving Group Works, as needs and awareness change. Now, more than ever, we need communities and organizations that function creatively and well. Group Works is a terrific contribution to making that happen. And as a bonus, it is fun to use! I recommend it.